Elton John and producer T Bone Burnett team up for the British singer-songwriter’s 32th studio album that is exuberant and loosely tied to his greatest hits of the 70s. Songs like “Tambourine” and “Claw Hammer” fit John’s classic sequence suit well. After years of songwriting with collaborator Bernie Taupin, the songs on “Wonderful Crazy Night” effortlessly tap the pop pulse on a fun-sounding album. Check it out from Elton John, iTunes and Spotify. Lucinda Williams’ folk-rock soul is gritty through years of songwriting and traveling . Her 12th album, “The Ghosts of Highway 20” is raw and emotional, hitting at the central nervous system of 2016 American culture. This is not a retrospective of a storied career, at 63 years old, Williams smirks at death definitely and also uses her versatile voice to fight against time. Get it from Amazon, iTunes and Lucinda Williams. The second release from British singer Foxes is the afterburner of an emotionally driven dance rocket blasted from an 80s house party. The songwriter doesn’t hide anything on this album; the pain and the stumbles along the away to moving past heartbreak are all documented on “All I Need.” Her vocals are set free on this album and allow her to explode into choruses and hurtle onto the dance floor. 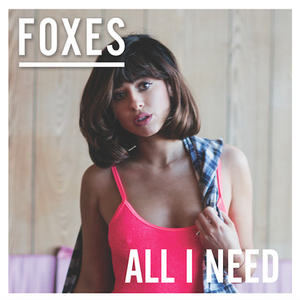 Check out “All I Need” from Foxes, on iTunes and on Spotify. It was a weird thing for me when Elliott Smith died. I was in college and I had seen him just a few months prior at the the Field Day Festival at Giants Stadium. By that time I wasn’t listening to him as much and then he was gone. “Heaven Adores You” which shares the same name as the documentary, is a collection of demos, early versions and some of his best moments like “Miss Misery,” on “Late Night With Conan O’Brien.” Learn more at heavenadoresyou.com Check it out at iTunes, Amazon and Spotify. Wiz Khalifa keeps getting better with each album that he releases. “Khalifa,” his sixth studio album, dropped hot with the single “Bake Sale” featuring Travi$ Scott. From there the album is all about the weed-puffing, lyric-spitting, world traveling Khalifa that continues the story of “Blacc Hollywood.” It’s not just great beats and fun lyrics but the inspirational story of his grind to the top makes me want to listen to this album. It’s supported by Rico Love, Courtney Noelle, J.R. Donato, Sebastian, Ty Dolla $ign, Chevy Woods and Juicy J. Check it out on iTunes and Spotify. Dr. Dog is one of my favorite bands recording today. The latest release from the Pennsylvania-based alt-rock band re-revisited its experimental debut demo tape recorded 15 years ago. The ambient sounds that played a smaller role on past albums stand out front here and simmer into a strange sonic stew. The album has less structured jams than the past eight albums, but it has multiple threads of brilliance that flare up throughout “The Psychedelic Swamp.” Get it on iTunes, Dr. Dog and Spotify.